These LED flameless candles are easily mistaken for real candles and are uniquely different from the traditional wax candles. 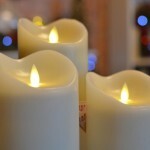 With these you get all the benefits of a candle with none of the drawbacks! They are even far more efficient than other flameless candles reducing maintenance significantly. There are many benefits from using flameless candles, the main and most important one being safety. With these you need not worry about leaving them unattended, there is no risk of fire nor does the LED produce any heat. You can sleep easy with the candle flickering away beside you and it would not matter even if it was knocked over and onto the bed. As they are flameless and produce no heat they are entirely pet and child friendly, if you have a child or animal they are at no risk. Unlike normal candles you also do not get any black smoke or burn patches on the ceiling, no black wick, no melting, no dripping. No mess. But aren’t they noisy and require batteries? They are in fact silent. They are not like standard electric candles and instead use electromagnetic technology to create the realistic flickering movement effect, so you are undisturbed. These candles do use 2 x C batteries, however they have a lifetime of up to 800 hours if left on continuously which is the equivalent of more than a month and even longer if used on the timer! On a timer they can last up to 4 to 6 months! This is significantly more than standard electric candles which normally use AA batteries and last up to around 6 weeks. Yes these candles even have an optional timer on them. They can be put on this setting which will set the candle to come on for 5 hours, then go off for 19 hours and come back on again for 5 hours. This cycle will continue until switched off again. Talk about low maintenance! They can be used anywhere for any occasion! 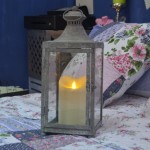 From your bedside table to a lantern in the garden. They are safe for use outdoors with no risk of injury, however you will need to make sure they are covered if it rains to avoid damage. This doesn’t mean you have to hide them though! A glass dome or rustic lantern would look brilliant and would suit them perfectly. 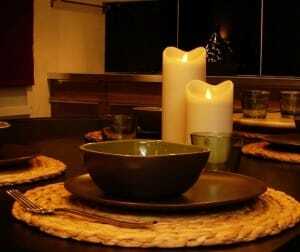 They look great individually for a simple effect or they can be grouped together to created a more dramatic effect. These all use the same batteries and operate exactly the same. ← Previous Previous post: Get Garden Ready!